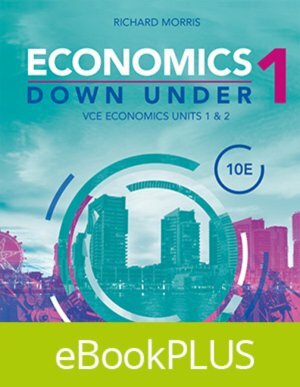 Economics Down Under Book 1 VCE Economics Units 1 and 2 10E eBookPLUS (Online Purchase) provides comprehensive coverage of the new VCAA study design for 2017-2021. For the first time, the Economics Down Under series will be published as eBookPLUS (digital) only. The digital format means that critical updates to content (for example, data, statistics, etc.) can be published quickly and easily to ensure currency. Economics Down Under Book 1 is the first title in its series. To view the rest of the titles in this series, click here.